Tiger Woods golf game matched his torrid private life as he crashed to a whopping 79 in the first round of the JP McManus Invitational Pro-Am. 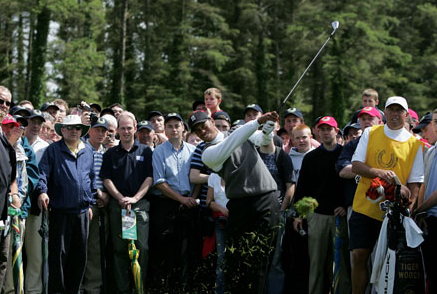 But if the world number one is concerned about his form and impending multi-million dollar divorce from his estranged wife Elin, he got resounding support from the 40,000 fans who packed Adare Manor as well as two multiple major champions in Padraig Harrington and John Daly. Crowds were packed 20 deep around the range as Woods blasted balls into the grey sky and while the world No 1 failed to match the electric atmosphere by producing some damp squib golf, he needn’t worry about getting a torrid reception when he hits St Andrews next week bidding for his 15th major title. With former Irish Walker Cup star Arthur Pierse on his bag, Woods showed little signs of a return to form as he bogeyed the second and fourth alongside former Irish rugby international Brendan Mullin and Swiss banker Bernard Droux. He eventually lurched to the turn in 40 blows, racking up a double bogey seven at the par-five seventh, where he bunkered his tee shot and dumped his third in the lake protecting the green. Things didn’t improve greatly on the back nine as he bogeyed the 10th, 14th and 15th to soar to seven over par. In fact, he had to wait until close to five and half hours into his round before picking up his first birdie of the day at the par-four 17th. But he handed that shot straight back as he dumped his second shot in the River Maigue at the par-five 18th and walked off with a six to equal his second worst round as a professional. Whether he was in any mood to chat afterwards is anyone’s guess as he left the course without saying a word. With a dozen Gardai clearing the way, the world No 1 was hustled into the back of a black car with tinted windows and driven off to the Manor house to spend the evening with his host. 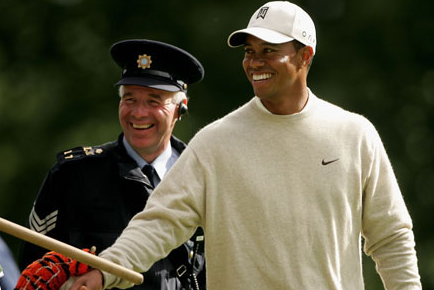 Unlike the PGA Tour, where he has occasionally be subjected to abusive comments from the fans following a string of tawdry revelations about his extra-marital affairs, Irish fans were still delighted to see the world No 1 back in Ireland after a five year absence. “I love you Tiger,” screamed one woman as Woods trooped down the sixth hole already two over par and soon to go four over. But three-time major winner Harrington insisted that he would not bet against him at the Home of Golf next week. Harrington said: “There is no doubt, if Tiger hits form at all he’s comfortably the favourite to win any of the majors and St Andrews sets up very well for him. 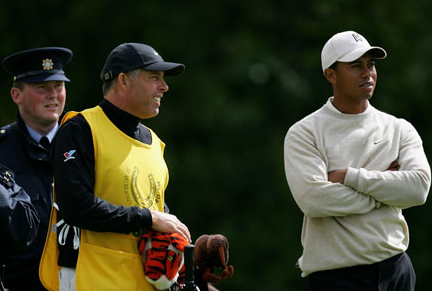 “Tiger has an advantage that he spins the ball very well. He’s the number one player at getting the ball to finish closest to where it lands out there and St Andrews requires that because of the firmness of the greens. Despite his troubles, “Wild Thing” turned “Mild Thing” Daly - he’s lost over 120lbs after lab-band surgery and can no longer drink beer - believes that Woods will soon be back to his very best. Believing that the world No 1 is just waiting to put troubles behind him before getting back to his top form next season, former Open and US PGA champion Daly reckons Woods might need a new coach following the resignation of Hank Haney in May. Woods wasn’t the only big name who failed to sparkle. US Open champion Graeme McDowell carded a 75 and confessed that he’s trying to get his game ready to chase major No 2 in the Open at St Andrews next week. McDowell said: “It feels like about two months ago that I holed that winning putt on the last green at Pebble. Hard to believe it was only two weeks yesterday. “It’s been a great two weeks and I always said if I won a major that you wouldn’t see me for three months - I would be on a beach in the Bahamas drinking myself stupid. “But there is a lot of golf to play this summer and good stuff to look forward to. At some point you have to get the business head back on, so tht process started this morning. Padraig Harrington shot a four over 76 and admitted that he’s worried about his chances of making the Ryder Cup team as he sits outside the nine automatic places in Colin Montgomerie’s team. Rory McIlroy hit a level par 72 and set his sights on matching pal McDowell by challenging for the Open next week. McIlroy said: “Seeing Graeme win made me realise that winning a major was a lot closer than I thought it was. Jim Furyk, John Cook, Peter Hanson and Rory Sabattini top the leaderboard by a stroke after one-under par 71s.